I recently finished a long task. I scanned at high resolution an archive of letters, postcards, newspaper clippings, small booklets, and other ephemera from the family of my mother's mother. The items dated from about 1912 through 1971, with the greatest concentration of them being from 1942-44, during World War II. This ended up being about 1800 scans. The majority of the items concerned my great uncle Arnold Wilhelm Mattias Stuuri (1913-1944). I think they were originally collected and saved by his mother Wilhelmina Elizabeth "Minnie" Hirvi Stuuri (1890-1946), since a few of the items are from her childhood and a few of the letters are from her brothers during World War I. As I understand it, these letters and items were for a long time stored in the attic of the Stuuri family home at 503 Independence Street, Fairport Harbor, Ohio. My great aunt, Adela Mirjam Stuuri Bixler (1918-2003), sister of Arnold, raised her family in that house. At one point she cleaned out the attic and planned to throw this collection away. Her youngest sister, my great aunt Alberta Elizabeth "Abbie" Stuuri Peterson (1928-1995), rescued the collection. Now it resides with Aunt Abbie's husband, Jerry Mervyn Peterson. The material gives insight into the lives of every member of this family, especially during the early 1940s. It also brings to life the small working-class town of Fairport during those years. The personalities of all the letter-writers stand revealed more or less. Attending one of the most beautiful and reverent services conducted in Fairport were hundreds of people who came to pay tribute to Arnold Stuuri, son of Mr. and Mrs. Matt Stuuri of 503 Independence St., who died at the Brooklyn Naval hospital last Thursday morning. Torpedoman Stuuri had served in the US Navy for three years and had been wounded at Casablanca in January, 1943. Note that final sentence about Arnold's being wounded. It's both incorrect and misleading. While scanning the letters exchanged between Arnold and his family, I tried to understand what exactly had happened to him--how he'd been wounded and what had led to his death. But I couldn't. The letters make the chronology clear, but are shy on details. My great uncle Jerry Peterson finally had the answer. He was already courting Arnold's sister Abbie when Arnold was in the US Navy during the war, and he went to visit Arnold in the hospital shortly before Arnold's death. 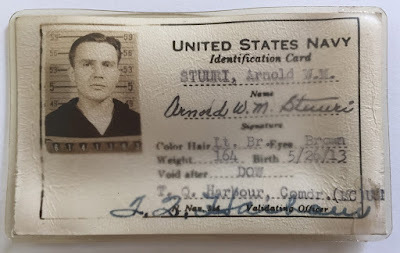 Arnold Wilhelm Mattias Stuuri US Naval idenfication card. Arnold joined the US Navy in January 1942, shortly after the United States of America entered World War II following the Japanese attack on Pearl Harbor, Hawaii. Arnold served as a torpedoman on two Navy ships during the war. The first ship was the USS Davis, which primarily patrolled the Caribbean and the east coast of South America. In Montevideo, Uruguay, on March 2, 1943, a depth charge fell on Arnold's foot and injured it. That was the wound that the above newspaper article references. The wound was not received in Casablanca, nor was it in January. It took Arnold quite a while to recover from that wound, primarily it seems because the doctor aboard the Davis didn't take it seriously enough. It wasn't until months later and a new doctor was assigned to the Davis that Arnold's wound was tended to properly in Bethesda Naval Hospital. In May 1944 Arnold was assigned to the USS Tillman, a destroyer that took him to Casablanca and Sicily. If he was wounded at Casablanca, it wasn't a wound of much consequence and it would have been in 1944, not 1943 as the newspaper article states. I doubt he was wounded at Casablanca. Stuuri family portrait, probably Oct. 1944. Arnold is third from right. In October 1944 Arnold had leave and went home to Fairport. 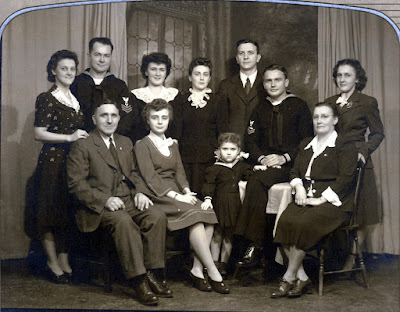 It's during that time that the photograph [right] of the family seems to have been taken. But when Arnold left Fairport on the train, he grew sick. He had a condition that had bothered him all his life, it seems, an intestinal condition that caused obstructions. The story as I've heard it is that people on the train assumed he was drunk. He was actually in pain and needed help. He made it to Grand Central Terminal in New York City and collapsed. He was taken to Brooklyn Naval Hospital. He was in the hospital for a couple months and died there just after Christmas 1944. The story I'd heard from family since I was small was that Arnold's seaman's bag disappeared in Grand Central. In that bag was supposed to be the manuscript of a book he was writing. My Aunt Abbie seemed to believe that Arnold's manuscript somehow ended up in the hands of author C. S. Forester, who passed off some or all of it as his own work. The elements in Forester's work that made her suspect this were the mention of a dog and the numbers of an automobile license plate that had been tacked up in the Stuuri garage at 503 Independence Street. I don't know why Arnold's seaman's bag disappeared. His parents had a receipt for his seaman's bag and his wallet. His sister Alice Lillian Stuuri Sinko (1915-2002) makes explicit reference to that receipt in one of her letters in the collection. Maybe whoever was storing the seaman's bag lost it before the receipt could be turned in. Or maybe his parents lost the receipt. Or maybe there was a deadline to redeem the seaman's bag with the receipt and that deadline wasn't met. I don't think anyone knows at this point. In the letters there are no references to Arnold writing a manuscript. He appreciated good literature. He was a good public speaker, winning debate competitions in high school. So maybe he was writing a book, too. I don't know how anyone could confirm that at this point. One of Aunt Abbie's daughters just gave me a little more information on the Forester book suspected to be or to incorporate Arnold's work. She says Abbie claimed it also contained "names of relatives, streets in Fairport Harbor & favorite Bible verses." I give that info here to supplement my post.